Hi there!!! WOW!! I've posted two days in a row. Can you believe it?? LOL!! It's Friday so that means it's Bellarific Friday!! Wahoo!!! This week we had a sketch to work with and believe it or not, I didn't change anything. I picked up the new Echo Park Beautiful Life this week so I knew I wanted to use it on my card. 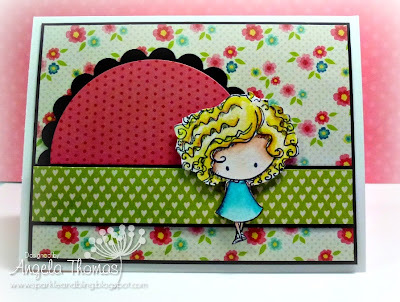 I've used the Stamping Bella image from the set called Arthur and Annie. I've colored her with Prismacolor Pencils and Gamsol and then cut it out so I could pop it up. Next week's Challenge is "Christmas in July" so make sure you email your card to Emily by Thursday! !